My new eBook, The Easy Guide To Chord Melody Guitar, is now officially released! The Easy Guide To Chord Melody Guitar is a complete A-Z guide on creating your own great sounding chord melody arrangements for trio and solo guitar situations, and you’ll also learn how to chord solo (i.e., improvise with chords) like a pro. Click here to get your copy of The Easy Guide To Chord Melody Guitar at the low price of only $24.99! 7 Chapters (356 pages) that break down essential chord melody and chord soloing concepts. Over 300 musical examples in TAB, diagrams, photos, and notation. 280 audio examples to make learning chord melody and chord soloing easy. 14 Backing tracks, so you can apply each concept to a musical situation. Chord melody arrangements from beginner to advanced levels. 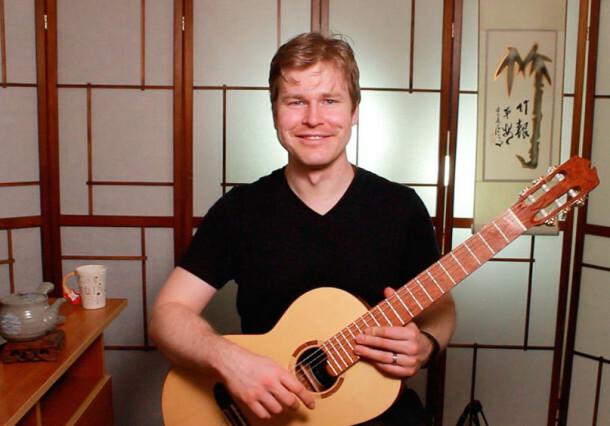 Chord soloing studies for beginner, intermediate, and advanced players. Comping studies for duo, trio, and solo jazz guitar. All for one low price of only $24.99! I’ve co-authored this brand new eBook with Matt Warnock and it’s been published by his website, Jazz Guitar Online. Matt and I have been collaborating on this eBook together for over a year, and we’re thrilled to finally have this ready for you guys! So who is The Easy Guide To Chord Melody Guitar eBook for? Are you feeling bored and stuck playing only single line melodies and solos? Do you play jazz guitar as a hobby at home and either don’t have the time to attend jam sessions, or have no jazz musicians to play with in your local area? In this case, solo jazz guitar is a logical choice – but you’ve got no clear ideas on how to get confident with this style? Have you ever wanted to learn how to play chord melodies or chord solos, but didn’t know where to start, or thought it was too difficult to even try? Do you listen to players such as Joe Pass, George Benson, and Barney Kessel and wonder how they get that smooth, sophisticated sound with their chord melodies and chord solos? If you want to learn chord melody and chord soloing, but never had a pathway to get started, then The Easy Guide to Chord Melody Guitar is for you. Click here to get your copy of The Easy Guide To Chord Melody Guitar now! What will you learn in this new eBook? Essential fingerstyle and hybrid picking techniques to set you up for chord melody success. Fingerstyle and hybrid picking licks in the style of Joe Pass, Lenny Breau, Kurt Rosenwinkel, and many more. Chord melody arranging concepts and full chord melody arrangements. Chord soloing phrases in the style of Wes Montgomery, George Benson, and more. Learn full chord melody and chord soloing arrangements in the style of Joe Pass, Ted Greene, and more. Everything you need to go from day 1 to chord melody mastery in your playing. Investing in your own development as a jazz guitarist is one of the greatest gifts you can give to yourself. And I’m sure your friends and family will enjoy the great music you’ll make as a result of this book too! 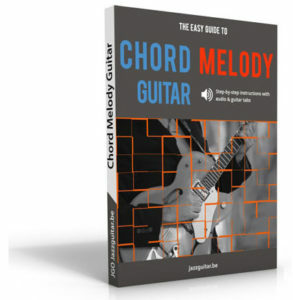 Click here to get your copy of the new Chord Melody eBook. P.S. Have a question about the new eBook? Email me at [email protected] and I’ll get back to you as soon as I can.